Have you ever wondered what would happen if you were enjoying a delightful time at the zoo and a zombie virus erupted and started infecting all the animals that you were there to see? Good thing that the infamous ‘king of independent b-movies’ production company called The Asylum has wondered that very thing too! Feast your eyes on Zoombies! 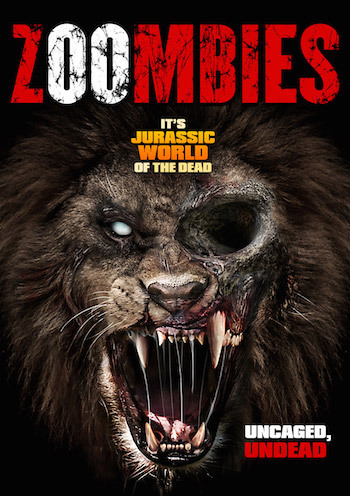 First of all, the title Zoombies is going to be really tough to beat for the ‘Best Horror Movie Title‘ award this year. And that’s saying something since the year has just started. But yes, if your dream has always been to see zombie lions and tigers and bears (oh my!) chase down and eat people, then your dream is about to become reality. I would give you the synopsis for Zoombies, but I think you can already figure that out Sherlock. Apparently this beautiful specimen will be making an arrival in March in 3000 theaters across the country! Just kidding – this will be going straight to DVD or maybe even the dumpster. Get ready for a Zoombies trailer (which will be magnificent) coming soon!